An immersive art and light installation! Enter a canvas of brilliant light and color and connect with works from the WAM collection in a new way! Imagine immersing yourself in a stained glass window or a Monet painting and being surrounded byand even part ofa cascade of shimmering, radiant, moving light and color. Lumina is made of dozens of strips of illuminated silk that reflect projected images of some of WAM's iconic works of art. 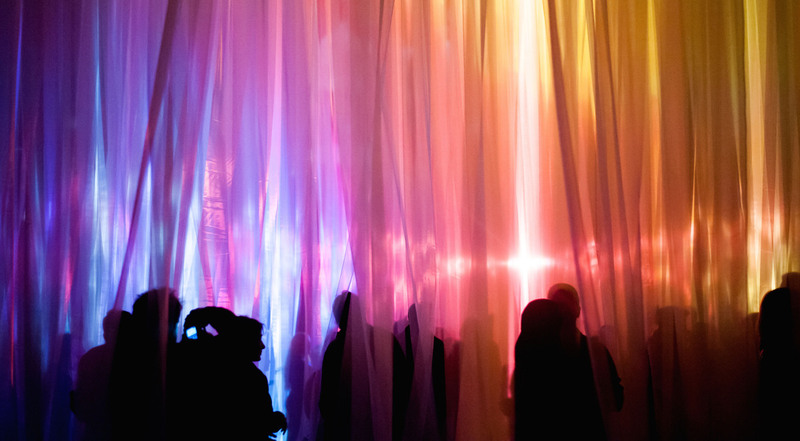 Visitors walk through the silk and become part of the animated color and light. Perfect for all ages, it's an irresistible setting for photographing oneself, family, and friends! Lumina is designed by artist Sam Okerstrom-Lang and Vanessa Till Hooper, and produced by LuminArtz, a non-profit organization that produces the ILLUMINUS festival in Boston. Image: Glitche by Sam Okerstrom-Lang.